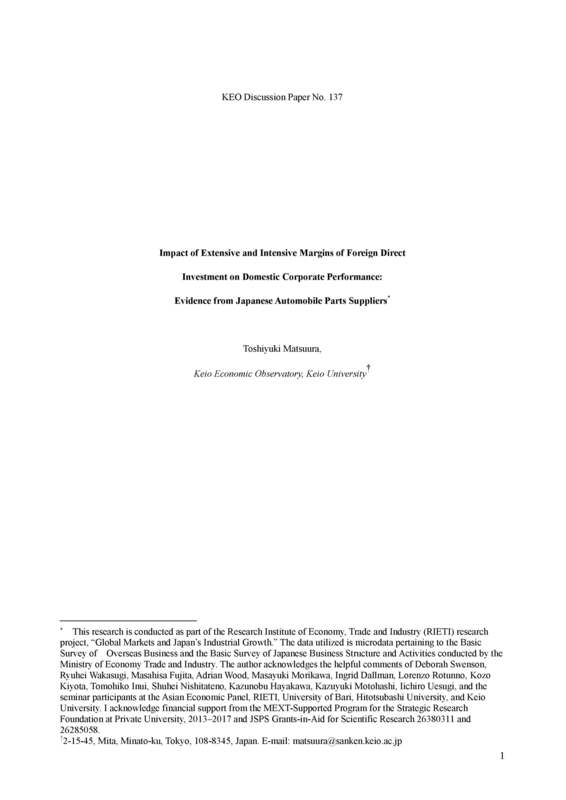 This study investigates the impact of foreign direct investment (FDI) on domestic corporate performance, using firm-level data of Japanese automobile parts suppliers. While previous studies used the propensity score matching method and focused mainly on the impact of the extensive margin of FDI, this study uses data on automobile makers' FDI as an instrumental variable for suppliers' FDI and estimates the impact of both extensive and intensive margins of FDI on domestic corporate performance. We find that while the intensive margin of FDI does not significantly impact corporate performance, the extensive margin positively impacts sales and total factor productivity. This effect is more profound in vertical FDI. Furthermore, the impact of the first flow of FDI is more profound than that of subsequent flows.